The area west of the Midland Railway main line between Old Ford End road in the south and Bromham road in the north was being developed as a residential estate to be called Queen’s Park in honour of Queen Victoria. The 20 acre strip between the railway and the undeveloped Hurst Grove was designated for industrial development. The first stage of the development was for a substantial brick built office building fronting onto Ford End Road with a 20,000sq.ft factory building behind it. Behind this again was separate foundry, smithy and pattern store. The whole factory was some 40,000sq.ft. , twice the size of the London works. 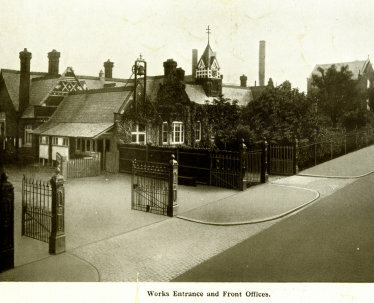 Some 100 of the London employees chose to move to Bedford, many of them rising to senior positions within the company. 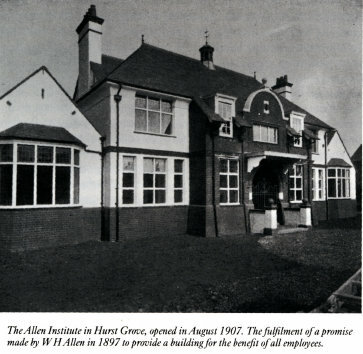 In 1905 the company celebrated it’s 25th anniversary and William Henry told his staff that, in order to fulfil a promise made some three years earlier, he had purchased ¾ of an acre of land in Hurst Grove for the building of what became the ‘Allen Institute’. This building provided for a library, games room, billiard room and smoke room. On the works side of the building was a large dining hall and kitchen. This dining hall proved the workers with a meal midday and in the evenings the hall could be used for social functions. This building is still in use today over 100 years on, but, following the closure of the factory, now operates as an independent club, but many of its clientele are ex-Allen men and women. With the 1950’s office block not surviving, the Allen Club, as it became known, is the only part of Allens remaining on the Queens Works site. Until the turn of the century pumps formed the main product of the company as this was a well understood technology. Great strides were made with newer technologies and steam engine design moved forward in great strides. Most steam engines were open cased with drip lubrication but as greater power and higher steam pressures were achieved the crankcases became enclosed. Lubrication was a magic art at this time with little understanding the theory behind it. Allens was in the vanguard of this development and their first totally enclosed forced lubrication steam engine was produced in 1897. During the years prior to the war Europe was a hive of technological innovation. Around 1906 the merchant marine was embarking on a race to build the biggest and fastest liners for the Atlantic crossing. The Lusitania and Mauretania provided good orders for Allens Fans and pumps, followed by similar equipment for the Cunard liners Umbria, Etruria, Campania and Lucania. In 1909 Allens received orders from the White Star Line for eight steam generating sets for the Olympic and the Titanic. One major problem in ships boiler rooms was the ability to get combustion air to the boilers and to reduce the temperature in the stoke hold. Allens produced their first engine with a forced draught fan in 1883. These units were a major activity at Allens well into the mid 20th century when steam gave way to diesels for main propulsion. It was known that the efficiency of a steam engine was greatly improved if the engine exhausted to a near total vacuum and during these years much development went on on surface condensers. These again became a mainstay in the Allen product line. In 1907 Allens produced their first steam turbines, to a German design, but Allens had signed a license agreement with Parsons in 1906. Single stage turbines were produced and these were shortly followed by two stage versions for electrical power generation. 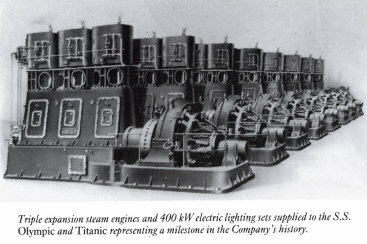 From these beginnings steam turbines became a mainstay of Allen production both for marine and land based applications culminating in the turbine generator sets in the Navy’s nuclear submarines, which are steam driven after all. Allens started producing internal combustion paraffin oil engines in 1907 with 6hp units driving 4” pumps. 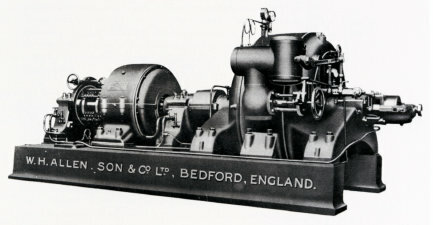 Allens first true diesel was supplied to Bedford Corporation Electricity department around 1910. The years preceding the Great War were ones of prosperity for Allens with a growing factory and workforce aided by the build up of the Navy preparing for a possible war.